Student choral groups from Jensen Beach High School, Student Middle School, Jensen Beach Elementary School and Felix A. Williams Elementary School will sing, student artists will display their artwork, and the middle and high school jazz bands will perform at the 8th Art, Music & Benefit Auction, presented The Entrepreneurship Foundation, Inc. and supported by the Jensen Beach Chamber of Commerce. 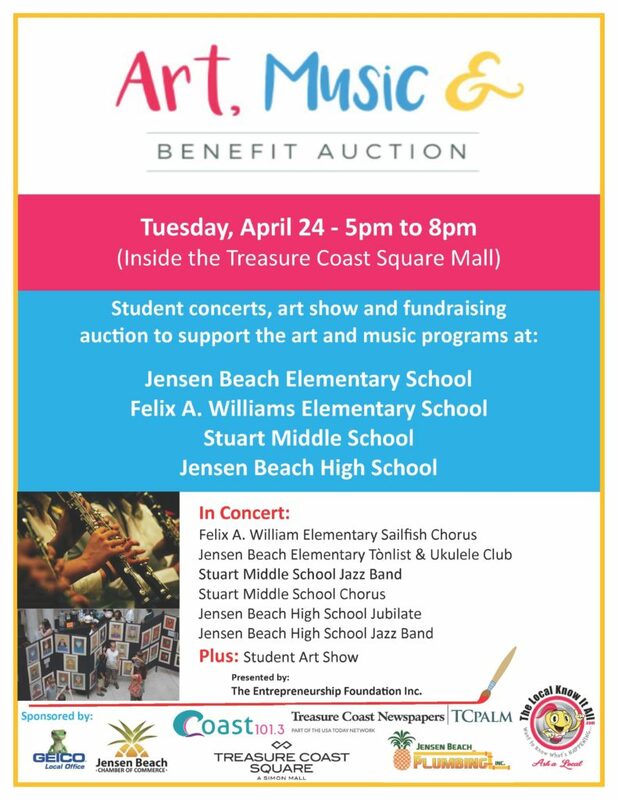 The popular annual fundraiser for the art programs of the participating schools will be held inside the Treasure Coast Square Mall directly in front of the Old Navy clothing store, on Tuesday, April 24, 2018 beginning at 5:00 pm. Performing on the Geico Local Office Stage will be the Jensen Beach Elementary School Tònlist and Ukulele Club, Felix A. Williams Elementary Sailfish Chorus, Stuart Middle School chorus and jazz band, plus the Jensen Beach High School Jubilate chorus and the jazz band. Top student artists from the participating schools will present an art show. The public is invited. Jensen Beach Chamber of Commerce member businesses donate hundreds of items for the benefit auction. The auction has raised nearly $30,000 over the past seven-years and the proceeds have been split evenly between the four schools. Auction donations from local businesses and residents are being accepted through April 20, 2018.